Simply Rins turned 3 this November 2012 and I decided a nail art contest is a good way to celebrate it. This blog has given me so much and I know that a big part of that is because of its readership. Let this challenge be my way to thank all of you for your appreciation, support, and most especially for your acceptance. The design must be hand painted. Stamping, marbling, using decals, using nail stickers, and using nail embellishments is NOT allowed. I do not have anything against these techniques and accessories. But since I've dedicated this blog to freehand nail designs, I decided to apply the same for this nail art contest. 02 - Theme: It's a Red Christmas! Well, you know I love red and since it's almost Christmas, I decided to combine the 2 ideas. Be creative and imaginative. The theme does not necessarily mean that you need a red manicure. Just make sure the overall design conveys the idea of a red Christmas. 03 - One (1) entry per person only. 04 - The nail design must be painted on at least four (4) of your own nails. You may have an accent nail, but all the other nails should also have a design. 05 - The use of nail wheels and stick-on artificial nails are NOT allowed. 06 - The nail design you will submit must be new and original. It must not have been previously submitted or published on any form of media. Clear quality, NO blurry pictures please. White background only. Let your design take centerstage. 09 - Use an analog signature to watermark your photo. An analog signature is a watermark that is included in the picture as you shoot and not added after. No digital watermarks please. This procedure will protect your photo from copyright infringement and will ensure that the picture is truly yours. You may use your full name or your nick name for the analog signature. If you have a blog, you may write your blog title and URL. print your name on a piece of paper. Copyright of all nail art photos remains to its respective owners. However, submitting a picture of your nail design for this contest means that you are giving me permission to publish it on this blog. 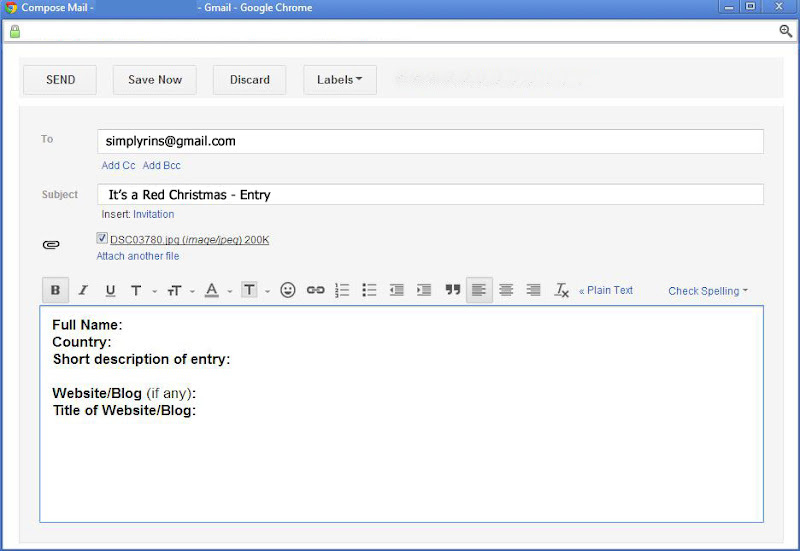 Write "It's a Red Christmas Entry" on the subject line. A confirmation email will be sent to acknowledge your entry. Invalid entries will also get a reply with corresponding reason/s. 13 - There will only be one (1) winner. All valid entries will be forwarded to our panel of judges on December 11, 2012. The final score for each valid entry will be the average of all the judges' scores. The judges will be given 48hrs to accomplish the score sheet. 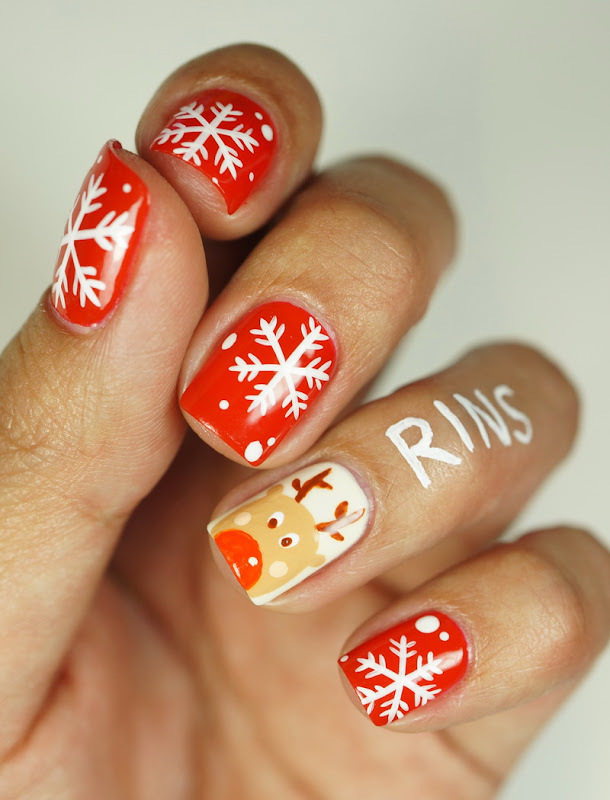 16 - Pictures of all the valid nail art designs will be published here in Simply Rins in a separate post on December 11, 2012. 17 - Please DO NOT post or share your submitted nail art anywhere online BEFORE I publish all the valid entries in this blog. 18 - This contest is open internationally as long as I can ship the prizes to you. She is one among many nail artists that is truly admired around the world, including myself. Deniz or more popularly known as trincess, has inspired a lot of nail art enthusiasts and has created nail designs that brought inspiration to us all. I am honored that this amazing lady from Turkey is one of our panel of judges for my 3rd blogoversary nail art contest. Gervin is a Filipino working in Tokyo, Japan. He maintains a fashion blog that won the Philippine Blog Awards 2011 Best Beauty and Fashion Blog, national category. He has a keen eye on things that are stylish and beautiful. His assessment will be valuable to this nail art competition. 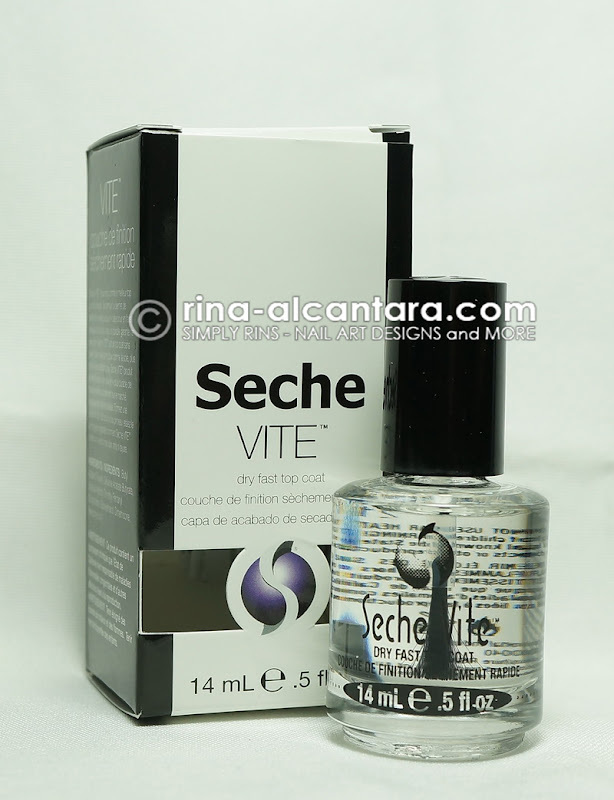 Ten (10) 15ml Elixir Nail Lacquers and one (1) 14ml Seche Vite Dry Fast Top Coat. I'm inviting and encouraging all nail art enthusiasts to join this nail art contest and celebrate with me the 3rd year anniversary of my nail art blog. I hope this event will become a venue for inspiration and an opportunity to challenge your creativity. GOOD LUCK to everyone and a special thanks to Digital Traincase for sponsoring such great prizes! If you have any questions or concerns, please use the comment section below. *The concept of analog signature was taken from Parokeets. Disclosure: Prizes were sponsored by Digital Traincase except for the Seche Vite Dry Fast Top Coat that was a personal purchase. Shipping cost will be shouldered by me. Just loved the snowflakes Nail, its so cute * o * ~ !!! Lovely Christmas mani. I hope I'll find the time to make a red Christmas mani myself. Ok I am in! This will be my first nail art contest, but I'm excited to do this. Thanks so much who have submitted early. Hi my nails are crazy short right now - is it possible to do a freehand nail art design on extensions as an entry? It would be fine as long as it is not a stick-on. This contest is officially closed. Thank you for all the lovely entries. Will be posting them within the day and a winner will be declared on December 15, 2012.